Isn’t she darling?! Our little nutgirl – the main reason for my prolonged absence on here – graced us with her appearance rather swiftly at a minute before midnight on January 4th! And while life wasn’t exactly sane beforehand, it certainly hasn’t let up. We’ll be moving countries – not to South Africa, as we had envisioned, but to Denmark as hubby has landed a rather good job there. I’m looking forward to it! Not to the actual logistics of moving I will readily admit, but to the living there. And hopefully staying put for more than a couple of years as well! She’s 3 weeks old now and the girly stuff is really beginning to grow on me – heaven help this girl!! NB: Turning ch2 does not count as hdc. (Foundation row, RS) Work hdc into 3rd ch from hook, and in remaining chain loops (35hdc), ch2, turn. Work 17 more hdc rows until work from beginning measures 6″ (15cm) long, ending with RS facing and omitting turning ch2 at end of last row. Ch1. Sl st in first 4 st. Ch2. Hdc into each st to last 4 st. Ch2, turn, leaving remaining 4 st unworked (27hdc). Work 14 more hdc rows until armhole measures 4″ (10cm) long, ending with WS facing and omitting turning ch2 at end of last row. Fasten off. (Foundation row, RS) Work hdc into 3rd ch from hook, and in remaining chain loops (17hdc), ch2, turn. Sl st in first 4st. Ch2. Hdc in each st along to end of row. Ch2, turn (13hdc). Work 5 more hdc rows until armhole measures 2″ (5cm) long, ending with RS facing for next row. 1st row: 1hdc in each st to last 3 st (10hdc). Ch2, turn, leaving remaining st unworked. 2nd row: hdc2tog. Hdc to end of row (9st). Ch2, turn. 3rd row: hdc in first 7st, hdc2tog over last 2st (8st). Ch2, turn. 4th row: hdc2tog. Hdc to end of row (7st). Ch2, turn. Work 5 more hdc rows until entire armhole measures 4″ (10cm) long and work from beginning measures the same length as Back, ending with WS facing and omitting turning ch2 at end of last row. Fasten off. With RS facing, work 25sc evenly along between beginning of neck shaping and lower edge. Ch1, turn. Work four more rows of sc. Fasten off. Work 17 more hdc rows until work from beginning measures 6″ (15cm) long, ending with RS facing. Hdc in first 13st. Ch2, turn, leaving remaining st unworked (13hdc). 1st row: sl st over first 3st. Ch2. Hdc in remaining 10st. Ch2, turn (10hdc). 2nd row: Hdc in first 8st, hdc2tog over last 2st. Ch2, turn (9st). 3rd row: Hdc2tog. Hdc in remaining 7st. Ch2, turn (8st). 4th row: Hdc in first 6st, hdc2tog over last 2st. Ch2, turn (7st). Work 5 more hdc rows until entire armhole measures 4″ (10cm) long and piece from beginning measures the same length as Back, ending with WS facing and omitting turning ch2 at end of last row. Fasten off. 2nd row: Sc in each st across. Ch1, turn. 3rd row: Sc in first 2 st, *Ch1, sk 1 st, Sc in next 4 st,* Repeat from * to * three more times. Ch1, sk 1 st, sc in final 2 st. Ch 1, turn. 5th row: Sc in each st along. Fasten off. (Foundation row, RS) Work hdc into 3rd ch from hook and in remaining chain loops (27hdc), ch2, turn. Rows 1-2: hdc in each st to end of row (27hdc), ch2, turn. Row 3: 2hdc in first st, hdc in next 25st, 2hdc in last st, ch2, turn. Rows 4-6: hdc in each st across, ch2, turn. Repeat rows 3-6 two more times (33hdc). Continue working hdc rows until piece measures 7″ (16.5cm). Place a marker at each end of the last row. Work two further hdc rows and fasten off. Attach edging colour with a sl st to bottom corner (the opposite end of the piece to your stitch markers), ready to start along the bottom of the RS of your piece. Ch1. Sc in each stitch across. Ch1, turn. Sc in first stitch. *Sk 2 st, 5dc in next st.* Repeat from * to * three more times. Sk 2 st, sc in last 2 st. Fasten off. Sew in Sleeves: Place rows above stitch markers along armhole edges of Fronts and Back to form square armholes, sew in place. Sew side and sleeve seams, reversing 2″ (5cm) of sleeve seam at bottom for turn-backs. I’m pretty sure my stitch count was out by this point on the purple cardi so the pattern for the edging is just notes rather than accurate stitch numbering! Attach edging colour 2 stitches on the RS before any corner (I suggest starting by the bottom of the button band) and work a round of sc all the way around the cardigan, working (sc, ch2, sc) to get around corners. Join with sl st. Ch1, sc in same stitch. *Sk 2 st, 5dc fan in next st, sk 2 st, sc in next st* around. Corners Bottom corners of buttonhole and button bands work 7dc into corner ch2 space. Top corners of buttonhole and button bands work 2sc into corner ch sp. Shoulder seams work (3dc, ch1, insert hook through shoulder seam to attach edging, 3dc). NB My stitch count may not be perfect so you may have to adjust the shells and corners slightly to suit. 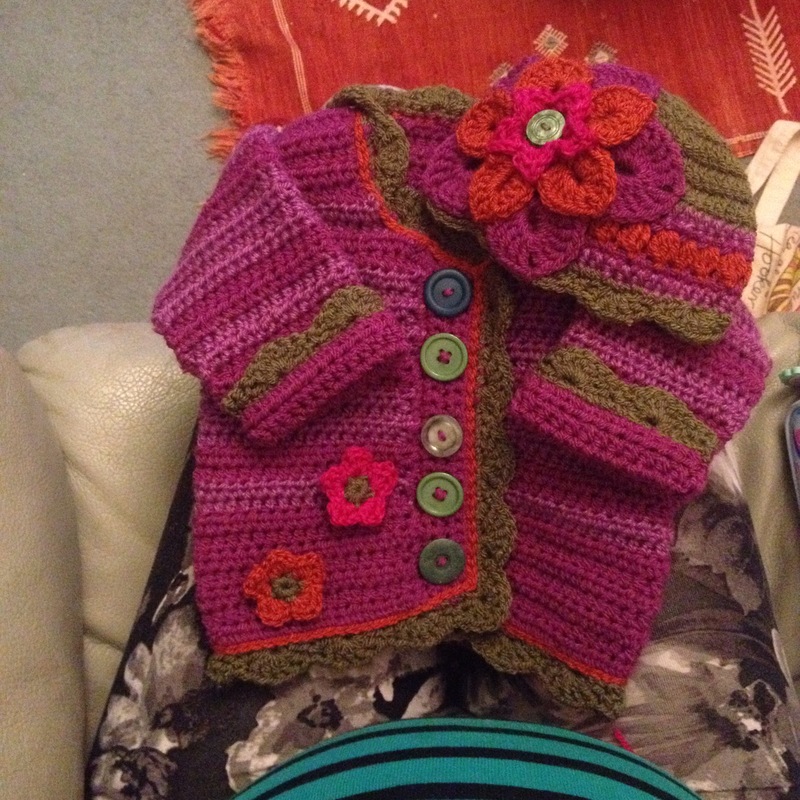 The orange piping was worked by slip stitching around between the purple cardigan and green edging. Sew buttons to correspond to buttonholes. I almost wish I could crochet! This entry was posted on January 24, 2016 by the messy mama in baby, clothing, crochet, life, messymamamakes.